An imposing hole from tee to green. A drive kept to the right of the left hand fairway bunker may feed down to the lower level to leave a short iron approach. From the top fairway level a mid to long iron will be required. The green nestles in the hillside and simply requires extreme accuracy. There is no bail out here. Warning!! This hole has ruined many a card. Avoid the bunkers on the right hand side from the tee, then lay-up short of where the fairway bottlenecks in the valley and then pitch to the green. Five is a great score here. 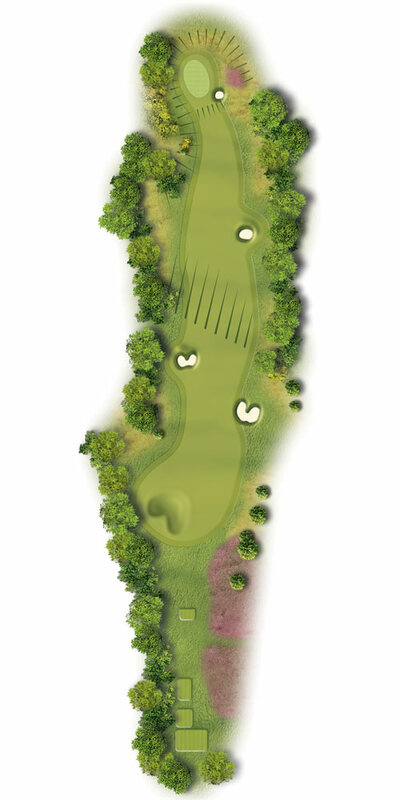 Take enough club to the elevated green and, once again, try not to go past the pin.